Media Matters details how over on Drudge Report, Mad Matt claimed Al Gore should be embarrassed to testify before a Senate committee about the climate crisis because clearly two inches of snow, slush and ice means there's no global warming. 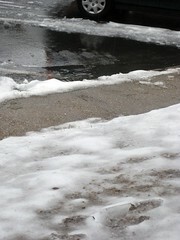 Yes, this two inches of wintry mix must be a sign of an oncoming ice age. Just look at my front yard! Isn’t it magical? It’s like I’m walkin’ in a winter wonderland. And if we don’t get ten inches of snow this winter, it will mark the first time DC has gone three consecutive winters without ten inches of snow in recorded history. But the media can’t dwell on that. Depressing news is just terrible for ratings. Much more entertaining to make fun of that buzzkill Al Gore! The Bush administration conducted a war on science. Now Republicans in Virginia's House of Delegates are declaring open season on the English language. How else can we interpret this post from the VA GOP Caucus blog, titled Is Moran trying to skirt alternative energy? Former Delegate and current Gubernatorial candidate, Brian Moran is against coal energy. Why, you ask? Moran believes that a proposed coal plant in Surry County will cause global warming and harm the Chesapeake Bay. Now, it doesn't take a genius to realize that coal is a natural resource that has not been linked to any environmental harm. In fact, it is a clean burning alternative fuel source. According to The Washington Post, Moran is using this to woo the environmentalists into his camp. However, this might cause Moran to lose a few votes in Southwest Virginia, where the coal industry is the major employer. Coal is good, Brian, and it does not cause global warming like your good friend, Al Gore presumes. Coal, which is barely above wood on the list of traditional, basic energy sources, is "alternative fuel"? Carbon dioxide emissions that warms our planet, sulfur dioxide pollution that leads to acid rain, and emitted mercury that ends up in the blood of pregnant women are "no environmental harm"? Coal mining, which employs only about six percent of workers in southwest Virginia, is "the major employer"? Virginia's House Republicans have transcended Orwellian euphemisms. They've now simply started using words not for what they actually mean, but for what they want them to mean for political purposes. Maybe we can all use this to improve our own lives. Don't like being fat? Just call yourself skinny. Don't like being poor? Call yourself rich! Unfortunately, Republicans have been deluding themselves about so much for so long -- all is well in Iraq! free markets solve everything! heckuva job, Brownie! -- that it's not a long leap from ignoring truth to abusing the very meaning of words. And we're all poorer for it. Or wait, are we rich? I can't keep it straight anymore. How Much Will We Choose to Change Our Climate? WASHINGTON (AFP) – Climate change is "largely irreversible" for the next 1,000 years even if carbon dioxide (CO2) emissions could be abruptly halted, according to a new study led by the US National Oceanic and Atmospheric Administration (NOAA). Would you like the minor increases in temperature, slightly higher sea level, and minor increases in drought and storm intensity we're already seeing at our current concentrations of global warming pollution? Or would you like to find out what happens if we continue to emit carbon at our current pace, doubling or even tripling our atmospheric carbon? See if we can melt the polar ice caps, submerge Chesapeake Bay islands, and make category 5 hurricanes a regular occurrence in the mid-Atlantic? Those aren't rhetorical questions. 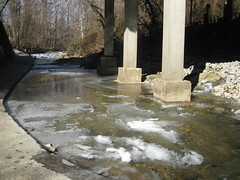 We (Virginians, Americans, humans) are currently choosing to take our chances with runaway global warming. Basically, we're telling our grandchildren, "Sorry there's no such thing as Virginia wine anymore since it's too warm and dry to grow the grapes, but getting off oil and coal seemed like more trouble than it was worth so we decided not to bother. Good luck fighting off the climate refugees." Here's a cool little promotion for the George Mason University men's basketball team. To make your night even greener, use Metro's trip planner to take public transportation to the game, just enter Patriot Center for your destination. "Go Green" night sponsored by AAA Mid-Atlantic. Concerned About Tax Fairness? Support This Bill. Raising the gas tax affects low-income people less than you'd think. Most of them drive fuel-efficient cars or take public transportation. It hits people who drive gas guzzlers the hardest, and if you can afford a mammoth Canyonero SUV, you probably weren't sweating a few cents difference in the price of gas when you did. If you're so concerned about taxing the poor, why aren't you speaking out about Virginia's incredibly regressive tax on groceries? The Middle Class and Small Business Tax Relief Act will repeal the state sales tax on groceries, repeal the corporate income tax for businesses making less than $100,000 per year, and cut the personal income tax for Virginians making between $17,000 and $75,000 per year, all while protecting existing money that is dedicated to public education and transportation. To accomplish that, the proposal would raise the income tax rate on people making more than $400,000 per year by 1.1 percent, affecting roughly 30,000 Virginians, or the wealthiest four-tenths of a percent of the state's population. Moreover, the legislation is written to ensure that there is no change in the amount or the timing of the current funds that go to local governments for public education and to the Transportation Trust Fund. I don't usually stray into the realm of taxes on this blog, but I couldn't pass up the chance to talk about this great new bill. A tiny tax hike on the richest 0.4 percent to give a tax break to literally every other Virginian? Sounds good to me. Virginia's GOP seems intent on blocking any positive legislation this year, but here's hoping this is one bill that can pull a General Lee on the roadblock Republicans. When I spotted a Cooper's hawk in my backyard a little over a year ago, I had to ask around if it was a Cooper's or a red-tailed hawk. After seeing this red-tailed hawk high above 5th Street North in Ashton Heights on Sunday afternoon, the differences between the two are a lot more clear. Namely, this guy could eat that Cooper's hawk in two bites. 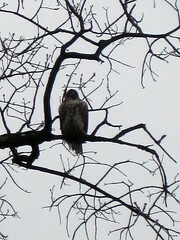 He was so big, I spotted him from my car even though he was perched about 70 feet off the ground. Always great to see more examples of Arlington's thriving hawk population. Meanwhile, anyone seen any skunks lately? With over a million people already crowding the Mall and the wind chill at 13 degrees, The Green Miles is watching the run-up to the inauguration from his nice warm living room with a hot cup of coffee. So I thought I'd take the opportunity to reflect on what a President Obama will mean for our national energy and environmental policies. Instead of a president who leads a war on science, we have a president who puts scientists in his cabinet. Instead of a president who denies and delays on climate change, we have a president who puts climate action at the top of his agenda. Instead of a president who lets a timber industry lobbyist manage our national forests, we have a president who'll preserve our natural resources for future generations. Instead of a president who declares America is addicted to oil but does nothing to cure it, we have a president promising to double our production of made-in-America renewable energy. I'm scheduled to appear on CleanSkies.TV at 2pm and 4pm to talk about what the Obama presidency means for clean energy and the environment. Any other thoughts on what I should say? 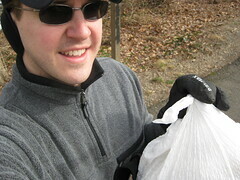 With a noontime wind chill in the single digits, I wondered if today's Arlingtonians for a Clean Environment cleanup to answer President-elect Barack Obama's call for a weekend of service would even happen. 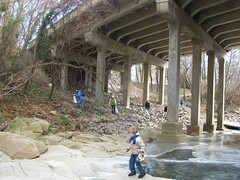 Instead, I arrived at Arlington Mill Community Center to find a dozen people already picking up trash from Four Mile Run and the surrounding area, another dozen grabbing bags and getting instructions, and another dozen still pulling up. I managed to fill one bag from the steep southern bank of Four Mile Run before my numb face and feet told me it was time to leave the rest of the cleanup to the eager kids scrambling all over. 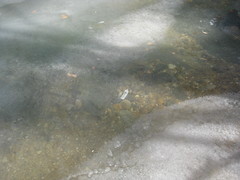 In fact, that was the best part of the event -- watching the children bounce rocks on the frozen stream, . One excitedly yelled, "Mom! Look! An animal bone!" He held up something smaller than a chicken bone -- but he'd found this in the wild! 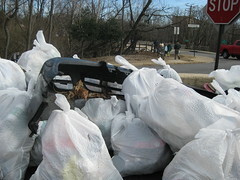 ACE is also partnering on cleanups on Sunday and Monday, you can get details at ArlingtonEnvironment.org. 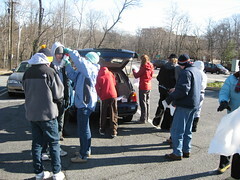 To find more MLK Weekend of Service events near you, visit USAservice.org. There goes my going out budget for the next, oh, three months or so. But these things only come along once every four years (if we're lucky). In the wake of his pleasantly strong energy proposal, Democratic Virginia gubernatorial candidate Brian Moran today restated his strong opposition to offshore oil drilling. Offshore drilling benefits only one constituency: Big Oil. The Bush administration's own Energy Information Administration has said that even if you drilled everywhere Big Oil wants to drill -- off the mid-Atlantic, off Florida, in Alaska, etc. -- it would only cut prices at the pump by a few pennies, if that. In return, we'd get more global warming pollution, higher risk of a spill, and no progress towards clean, made-in-America renewable energy sources. Moran's stand also sets up a strong contrast with presumptive Republican nominee Bob McDonnell, who still parrots the "drill, baby, drill" slogan that sent dozens of Republican candidates down to defeat last fall. The crowd behind him appears almost 100% white with maybe one or two Hispanic faces. The best part? It's photoshopped! Couldn't they pick a picture to photoshop with at least one black person in it? Apparently even the best cutting-edge technology can't make Republicans look multicultural. From the same photoshopped crowd, the guy with the McCain-Palin sticker in the front row. Again, couldn't airbrush that out? I'm already fired up about beating this guy. And it's only January. Under Moran's plan, Virginia would need to get at least 25 percent of its power by 2025 (and 20 percent by 2020) through renewable energy or increases in energy efficiency. Lumping renewable energy and efficiency together is a bit clumsy. It also makes the campaign's claims the plan would "put Virginia in the top ten states nationally" pretty dubious since most of those states don't allow utilities to use efficiency to meet the goal. Ideally, Moran wouldn't include efficiency in his 25 percent by 2025. If he does, he needs to specify how much of the 25 percent can come from efficiency improvements. Moran's plan puts him far ahead of McAuliffe, at least for now. Terry has been talking about taking Virginia's voluntary 12 percent by 2022 renewables & efficiency standard and making it mandatory. He'll need to come up with a much stronger plan if he wants to hold the mantle of the boldest candidate on clean energy. In such a tight race, Creigh Deeds risks fading into the rear view mirror if he doesn't at least match Moran's plan. What are your initial thoughts on Moran's renewables and efficiency plan? Coal is a cheap, reliable, plentiful fuel source. Coal needs massive taxpayer subsidies to survive. Everybody got that? Our only choice is to stay addicted to coal while we dump billions of dollars into a hope that someday, coal can be used to produce energy without polluting our air and warming our planet. The op-ed is so terrified of clean power sources like solar and wind, getting cheaper by the day, that it dare not even speak their names. The Green Miles gave up wrapping paper this Christmas. Instead, I used gift bags or re-used gift bags I'd saved from last year. It saved time on wrapping and money on paper, but was also more environmentally-friendly. Considering how much dye, laminate, glitter, etc. go into its production, wrapping paper is often times not recyclable. And even if it is, how many recipients will actually recycle it? But The Green Mom one-upped me this year. 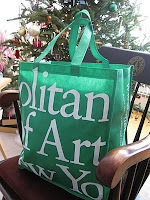 She gave me my Christmas presents in a reusable bag from the Metropolitan Museum of Art in New York City. Excellent idea! If you're in the market to replace some strings of X-mas lights, opt for LED. They carry an Energy Star label and can save up to 88% on electricity. And they'll all be on sale half price at this time of the season. Excellent point! I'm off to stalk the aisles of CVS for sales. At long last, my URL backorder has come through. You can now access The Green Miles through TheGreenMiles.com. 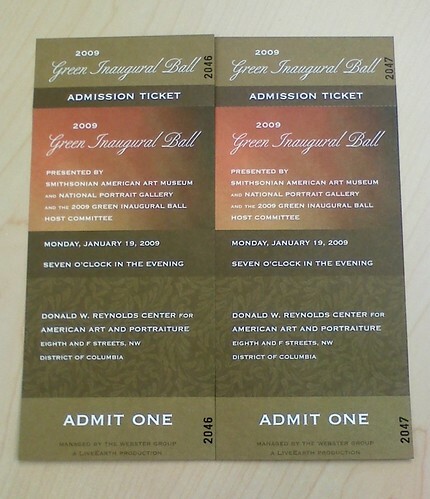 You can still access this page through TheGreenMiles.net and through the full link, TheGreenMiles.blogspot.com.